Walking into Tatsu Ramen is not unlike that moment you find out your mom’s on Instagram and isn’t following you. How long has this been happening and why did no one tell me? Is this what the future looks like? Am I loved? You see, at Tatsu waiters and waitresses are a thing of the past. Their line of work has been replaced by a far more effective and compassionate race: the iPad. You walk up to it, greet it and in no time at all, your electronic bff has placed your order and the kitchen has received it. What a world. But suddenly though, you spot your first homosapien. Weird. A blood-flowing plebeian hired to help you find a table. Don’t trust it. Because how do we actually know THESE are even humans? We don’t. Sure, they were kind, intelligent and engaging on a personal level, but they easily could’ve just been robots or walking iPads or flesh-covered Google watches. Things to think about. But minutes later, out comes your perfectly ordered ramen and you are in heaven. 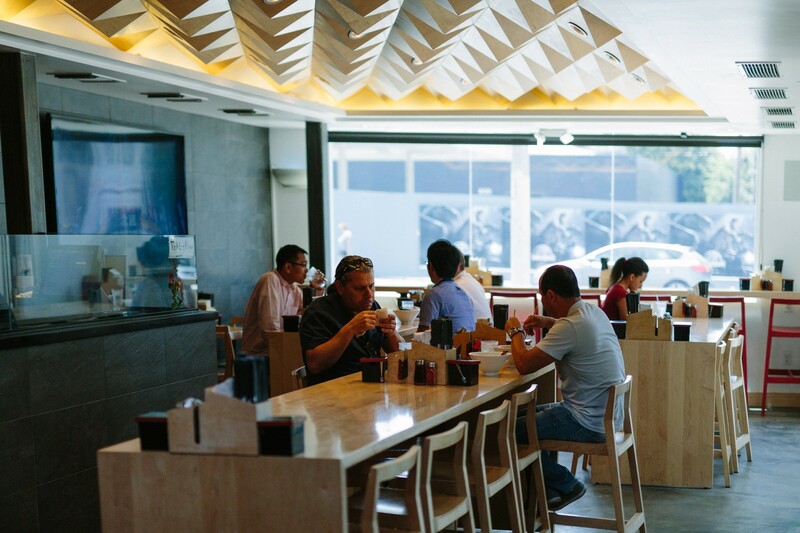 It’s no secret that ramen is as hot a cuisine in Los Angeles as any and Tatsu is at the forefront of the popularity wave. Its signature Soul Ramen is what brings in the crowds, but if you have some adventure behind those eyes, get the Bold Ramen and you will be rewarded with a smoky, rich Tonkotsu broth that tastes just as good at lunch as it does at 3am on Saturday morning. Tatsu is the future not just because of its iPad wall waiters. It’s the future because it’s perfectly streamlined, yet highly personalized. Quick and easy, and downright delicious. Now don’t get worried, the sit-down restaurant formula isn’t going anywhere. But we know more than a few places who could take a page out of Tatsu’s e-book of efficiency. Tatsu’s signature ramen. Tonkotsu broth, black garlic oil, and sweet umami sauce combine to give that unique flavor. They aren’t lying, this sh*t does the soul good. They claim this to be their most popular ramen variety and we believe them. Its the same flavors of the Soul Ramen, but just in hyperdrive. And everybody wants to drive faster in this town. A more classic version, this is definitely the best order for a beginner eater or anyone who still thinks ramen is cooked in a microwave in a dorm room. Call it sacrilegious, but this brothless wonder is absolutely delicious and comes with a sweet sesame glaze and whole-wheat breadcrumbs. KEEP HATING HATERS. For all the vegan friends in the world, this is solid option to let everybody in on the fun. Sweet onion and soy sauces, combined with ginger give it a quality unlike anything else on the menu. Hinoki & the Bird is cooler than most options in Century City, and an ideal spot for your next power lunch. Even if you won’t remember the food.